Whenever I find myself driving down Ventura Boulevard on a sunny weekend morning or early afternoon (moon roof open and iPod on shuffle), inevitably, my eye would be drawn to the crowd of people just outside a little yellow building that channels a rustic, welcoming feeling. My eye would then look up and smile at the charming marquee. Sweet Butter. Something in the name just grabs you. I don’t think there’s anything that I enjoy more than kicking-off a weekend by going out to breakfast. Sadly, it’s not something I get to do as often as I’d like, so I’m particularly picky when choosing a place. I’m all about the food (of course!) but I admit that I’m a sucker for good ambiance. I trust that when my fellow Angelenos feel the need to wait on the sidewalk for a table, it must be for something pretty special. Angelenos don’t typically have the patience to just stand around…especially when you can walk 2 minutes in either direction to find somewhere else to eat. After hitting Yelp to ensure legitimacy, Sweet Butter became the next place to conquer. Though I can appreciate the kind of business that has people so into it that they’re willing to stand on the sidewalk for scrambled eggs, I made it a point to go during their slower time for my inaugural visit. It was a crisp, Friday morning in January around 10:00am, the place practically deserted. In other words, perfect timing. I was immediately struck by the “homey” feel to Sweet Butter and the use of the space. As you enter through wrought iron gates you’re instantly welcomed by a seating area, doors on either side of it. The one of the left leading to where the magic happens, the kitchen. The one on the right, where you consume and enjoy the magic. It holds the bakery, market, coffee bar, and most importantly, it’s where you order. The menu is diverse enough to cater to anyone’s needs – whether you’re in the mood for breakfast (served all day), a hearty salad, a sandwich or a wrap. The same attention given to the decor, is equally allocated to the ingredients used on the menu. Sweet Butter’s turkey, chicken, and beef are all free-range or grass-feed. They personally make their own salad dressing, spreads, and pastries in-house using the freshest of ingredients, without preservatives. Are you vegan or gluten-intolerant? Heck, do you need a last-minute gift for the foodie in your life? Sweet Butter’s got you covered. Caffeine addicts: I was beyond bummed when I ordered a “vanilla” latte and was told that they don’t make them. (Boo!) The baritsa was quick to try to put a smile on my face and offered their signature “sweet latte” made with simple syrup instead. My frown was instantly turned upside down. She was right. I didn’t miss the subtle sweetness of vanilla, the simple syrup did just the trick – and I’m sure in a much healthier fashion. Admittedly, I’ve been back a handful of times just to stop in and grab a latte to-go. I must have passed the wrought iron gates and yellow walls of Sweet Butter on Ventura Boulevard dozens of times over the last few years, always making a mental note that my next girl’s brunch would find me there. Unfortunately, the blessing and the curse of living in a big city with dining options abound, is that it’s slightly overwhelming! I simply never got around to it. I don’t know what it was that made me finally stop being so curious about what was on the other side of the crowded sidewalk. Perhaps it really came down to feeling like I was missing out. And indeed, I was. Since there are as many cafés in LA as there are out of work actors, I’m looking for what makes an establishment stand out. Of course, a long line of devotees is a good start, but what more does it have to offer? Sweet Butter creates an experience around food. From the quality ingredients, to the welcoming decor; the artisan shop, to the best latte I’d had in a while. And you know me, if the latte’s right…I’ll be back. PROS: Great ambiance, quaint market, fresh ingredients, well-curated breakfast and lunch menu, staff friendly, vegan and gluten-free options available, pay before you eat (perfect for when you don’t want the hassle of splitting the bill), and online ordering ready for in-store pick-up. CONS: Parking is difficult (but when is it not? ), coffee is pricey (but worth it), the lunch rush and weekends are extremely busy (I waited 45 MINUTES during my second visit to receive my order), and hard to find a table during rush times. I might lose cool points for this (depending on the person), but there’s nothing that I’m more excited about on the fashion-front than the return of overalls. Yes, you read that right. Overalls. Admittedly, after many moves since those collegiate years, and multiple closet purges, I could never quite bring myself to throw them out and said overalls are STILL hanging in my closet (albeit deep in the back) as I write this. Suffice to say, I have a lingering fondness for overalls, though I haven’t personally worn them in over 10 years now. My boyfriend has laughed at me more than once when I’ve mentioned that I’m thinking about buying a new pair and rekindling my secret love affair with that illustrious one-piece denim suit with the built-in denim-clad suspenders. 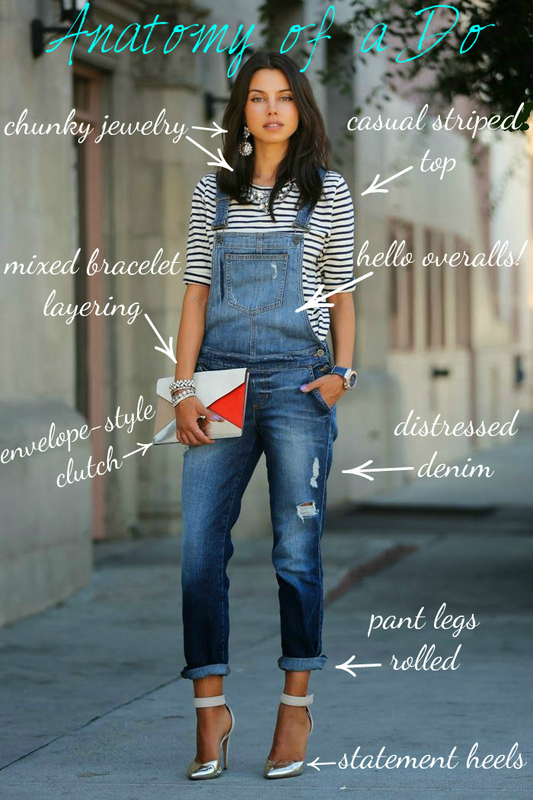 And I’ve found the perfect styling inspiration from Annabelle over at Viva Luxury on the right way to rock the return of overalls…and keep it 2014 appropriate. What immediately makes this look very modern and fresh is that Annabelle chose a fitted pair of overalls in a dark wash, with just the right amount of distressing at the hip (as opposed to a baggy fit in a stone wash, channeling 1995). She keeps that momentum all the way through via the rolled pant legs, which produces a more relaxed feel – and highlights those amazing metallic Armani ankle strap heels, playfully contradicting the overall casualness of the ensemble by including a touch of polished high fashion. When accessorizing, nothing screams “on-trend” at the moment so much as chunky statement jewelry and the dynamic layering of bracelets built of different styles and textures. Further, so as to not compete with our focal piece, Guess’ Classic Denim Overalls, she opts to carry a light clutch over a large satchel or cross-body to impeccably bring the look together. What I adore about the styling here is the contrast of ultra glam against super casual, showcasing a creative approach for a piece that many might consider a trend best left in the last millennium. I can certainly see the argument for those in favor of and against its return. Overalls aren’t necessarily an easy thing to pull off. Despite how comfortable they can be, there’s a limit to how and where a gal might be able to wear them particularly, over the age of 10. However, I think Annabelle found the best inspiration I’ve seen yet. I think I might have to take the plunge and grab a pair before the window closes and overalls are, yet again, a thing of the past. This is the anatomy of a do… and it’s the overall comeback.